Provide comfort for the family of Mary Alice Langlotz with a meaningful gesture of sympathy. 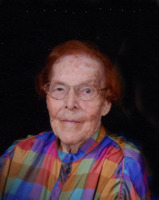 Mary Alice Langlotz, 95, of Waco, died March 16, 2019 at Providence Hospice Place. Visitation will be 5-7 p.m Tuesday, March 18, at OakCrest Funeral Home. Rosary will be Wednesday, March 20 at St. Mary's of the Assumption Church at 9:30 a.m followed by Mass at 10:00 am with Rev. Joseph F. Geleney, Jr. officiating. Burial will follow at Waco Memorial Park. Mary Alice was born Nov 7, 1923 in Bessmay, TX to Claude Fuller and Vera Jayroe Fuller. Soon after her high school graduation from Buna High School, her family, which included three brothers and two sisters, moved to Waco. She met a handsome soldier, Arthur Langlotz, Jr., and they were married in Waco on Dec 1, 1942, a union that lasted 52 years until Arthur's death in 1994. Mary Alice was very active in the lives of her three children, Charles Ray, Jimmy and Donna. She volunteered at their schools in various ways from their elementary through high school years. She then volunteered at the Providence Hospital Gift Shop, St. Mary's Womens' Guild, DAV Ladies Auxiliary, and RVOS Organization, holding Office positions in some of them. She began working part-time at Baylor University in 1983 and then was employed full-time in the Accounts Payable Office from 1985 through her retirement on Jan 4, 2010 at the age of 86. She loved her “Baylor Bears” and all her Baylor Family dearly. She was preceded in death by her parents; three brothers; five brothers-in-law; six sisters-in-law; husband; sons, Charles Ray and Jimmy; son-in-law, Harold; and grandson, David. Survivors include daughter, Donna Baker; daughter-in-law, Lisa Langlotz; special family member, Pattie Turner; granddaughter, Lorie Macon; granddaughter, Melinda Hedrick and husband Brent; grandson, Joe Baker; and great granddaughters, Tinsley Hedrick and Ella Hedrick. Pallbearers will be Brent Hedrick, Joe Baker, Mark Stelly, Dan MacLemore, David Sterling and Michael Jansing. The family would like to extend special thanks to the staff who lovingly cared for her at Providence Hospital and Providence Hospice Place, her many adopted family members, Baylor family and Waco Montessori School family. To send flowers in memory of Mary Alice Langlotz, please visit our Heartfelt Sympathies Store. We encourage you to share your most beloved memories of Mary Alice here, so that the family and other loved ones can always see it. You can upload cherished photographs, or share your favorite stories, and can even comment on those shared by others. Love and prayers. Greg, Roxann and Tommie sent flowers to the family of Mary Alice Langlotz. Heartfelt Sympathies Store purchased flowers for the family of Mary Alice Langlotz.